Wobble, shimmy, tankslapper, speed wobble, and even death wobble are all words and phrases used to describe a quick (4–10 Hz) oscillation of primarily just the steerable wheel of a bike. The “tankslapper” is a very frightening experience. Usually occurring when accelerating hard over bumpy pavement, a tankslapper ensues when the front tyre becomes airborne, then regains traction outside the rear tyre’s alignment. The resulting deflection bounces the tyre off to one side, followed by another bounce in the opposite direction as it contacts the pavement again. 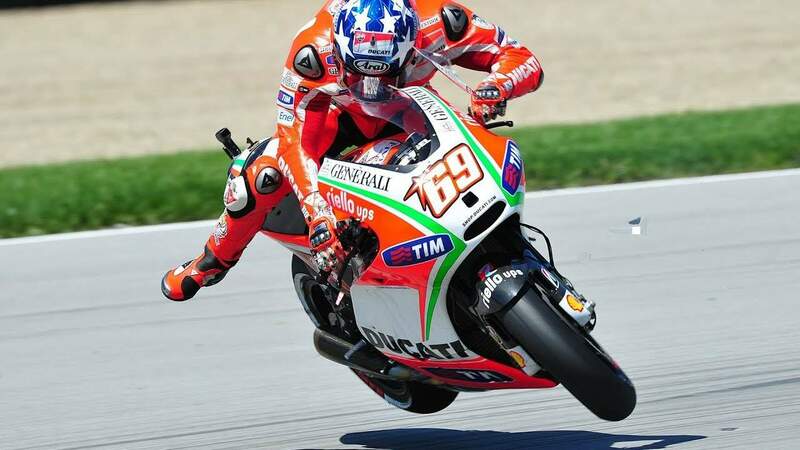 Unless the bike’s steering geometry is able to damp out the deflections quickly, the resulting oscillations from the front tyre as it bounces back and forth will swiftly gain in strength, causing the bars to swap from side to side with increasing ferocity. The oscillations can be violent enough to rip the bars out of your hands, and fling your feet off the pegs. You can guess what happens next. The easy cure for this problem is a steering damper. Many sports bikes now come stock with one, as the radical steering geometry needed for quick handling can otherwise cause some instability in certain situations. While a steering damper is an easy fix, it shouldn’t be a cure-all; if you’re forced to adjust the steering damper’s stiffness (if available) until you can barely turn the bars in order to keep the bike’s handling stable, there is a problem somewhere in your chassis setup. A too-stiff steering damper can also cause handling problems by itself; if your steering damper is adjustable, and you find that your bike won’t hold a line (especially in slower corners), or gets into a small wobble or oscillation in high speed corners, try backing off the stiffness a little and see if it helps. Not all sports bikes need a steering damper, however. Many have steering geometry setups that offer quick handling, while still providing the necessary stability to damp out any front-end oscillations. In most cases, one of the biggest contributors to a tankslapper is your body positioning and grip on the bars. Some people ride in a more upright position when carving corners, but when accelerating over bumpy pavement, that upright body position puts even more weight transfer to the rear, which causes the front end to get lighter. Also, the more upright torso means that your grip on the bars is tighter in order to stabilize your upper body. That firmer grip feeds more input into the front end, something it doesn’t need while it’s busy trying to damp out the inputs from the bouncing front tyre. It actually forms a vicious circle: you grip the bars tighter because they’re starting to flap back and forth, but that only feeds more input into the front end, compounding the problem further. The easiest way to avoid tankslappers while accelerating over bumpy pavement is to—believe it or not—keep a relaxed grip on the bars. Relaxing your grip on the bars means you must lean forward in order to assist in keeping your torso stabilized. This helps put more weight on the front end, which keeps the front tyre on the pavement. Since you’re not using your arms to stabilize your upper body, get your weight onto the footpegs so that you can get your body as far forward as possible; this also allows you to grip the tank with your knees for more stability. Harmonic feedback means that a small force is being applied EXACTLY in-phase with the end of a counter-force (shock absorber) which results in another 'bounce' of the system AND AN AMPLIFICATION of the previous bounce.